if you’re faithful to my blog, you know that i’m not a huge fan of asian food. it’s growing on me, but i’m still not giddy over it. well, the point of this blog, for me, is to try new recipes/cooking styles and so i’m charging forward with all things new. this recipe scored a 6.5/10 on the tom scale for lack of flavor and choice of vegetable. i think i would give it a 7, because i did like the crunchiness of the peas, but this wasn’t my favorite asian dish that i’ve made. that honor goes to orange chicken. whisk together 3 tbsp soy sauce, 2 tsp sesame oil and honey in a bowl. toss in the chicken and marinate for 20+ minutes. remove the chicken from the marinade using a slotted spoon. heat 4 tsp canola oil in a nonstick skillet over medium-high heat. cook the chicken, turning once or twice, until browned, 3-5 min. transfer chicken to a plate and wipe out skillet with a paper towel. heat the remaining 2 tsp canola oil in the skillet. add the scallions, garlic and ginger and cook, stirring 1 min. whisk the broth, sugar, cornstarch, vinegar, chili powder and the remaining 2 tbsp soy sauce in a bowl; add to the skillet and cook, stirring until thickened, 3-4 min. stir in the remaining 2 tsp of sesame oil. meanwhile, cook the snow peas in a pot of water, 1-3 min. return the chicken to the skillet with the sauce and heat through. 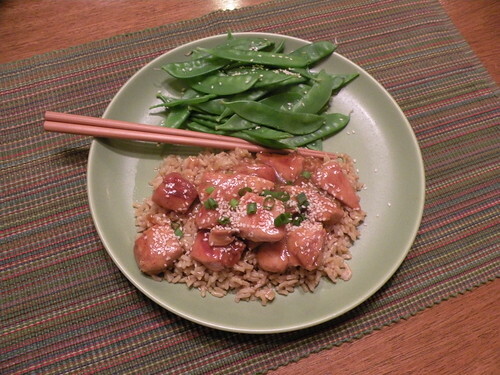 serve with chicken and snow peas over brown rice. top with sesame seeds and extra scallion greens. So I had an epiphany while reading your blog. I know why you don’t like Asian food….the absence of cheese! it’s true and also explains why I do love crab rangoon so much!